Nicolas Frankel demonstrates a test harness with Cucumber and touches on Spring and Selenium as well. This week, my team decided to create a smoke test harness around our web app to avoid the most stupid regressions. I was not in favor of that because of my prior experience with the fragility of end-to-end testing. But since we don’t have enough testers on our team, that was the only sane thing to do. I stepped forward to develop that suite. Selenium to manage browser interactions. TestNG for the testing framework. TestNG is a much better choice that JUnit (even compared to the latest 5th version) for end-to-end testing because it lets you order test methods. However, the problem with this approach is readability when failures happen. Stack traces are hardly understandable by team members that are not developers. After having developed something that worked, I thus wanted to add some degree of usability for all team members. Cucumber is a BDD tool available on the JVM. It can be integrated with Selenium to have a thin BDD layer on top of GUI testing. A feature, as its name implies, is a high-level feature of the system. It contains different scenarios, smaller-grained features that realize a feature. Each scenario is made in turn by a combination of step_s: _Given, When and Then that are well-know to BDD practitioners. In Cucumber, a feature is written in its own file Gherkin. The step definition is a Java file that implements in code the steps described in the feature. Last but not least, the test class is a JUnit (or TestNG) test class that binds the two former components. For example, let’s analyze how to create a test harness for an e-commerce shop. On line 1 stands the name of the feature. The name should be short and descriptive. On line 2 is some longer text that describes the feature in detail. It’s only meant for documentation. The title of the scenario is set on line 8. Initialization is set on line 9 with the Given keyword. On lines 10 and 11 are some assertions via the Thenkeyword. Note that And could be replaced by Then but it feels more readable. On line 12 is an interaction, the When keyword is used. And on line 13, we assert the state of the app again. Let’s forget for now about line 1 from the above snippet and focus on the rest. Cucumber matches the step defined in the feature with the method by using the first parameter — the regexp. Parameters can be defined in the feature and used in the step. As an example, compare line 10 of the first snippet with line 8 of the second: the regexp will capture the number of categories so it can be easily changed in the feature without additional development. The second method parameter is the lambda that will get executed by Cucumber. Given I’m using a Java runtime v8, those methods are default methods implemented in the En interface. There’s one such interface for each available language, so that step definitions can be implemented in your own language. 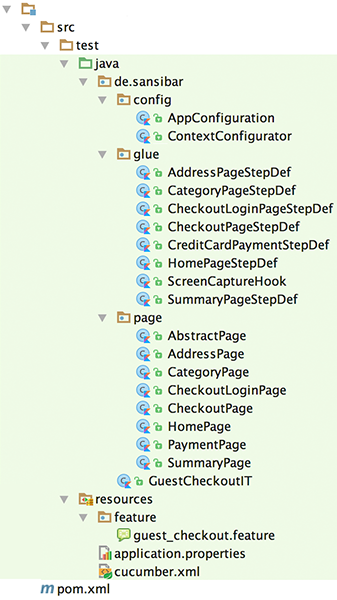 The class has no direct dependency on the Selenium API, it’s wrapped behind the Page Object pattern (see below). As you can see, it’s empty: it just provides the entry point and binds a feature to the step definitions package. At that point, running the test class in the IDE or through Maven will run the associated Cucumber feature. So far, so good. But the existing code deserves to be improved. I cheated a little for this one as it was already implemented in the first TestNG MVP but let’s pretend otherwise. This approach is known as the Page Object pattern. Mixing selectors and tests into the same class makes tests brittle, especially in the early stage of the project when the GUI changes a lot. Isolating selectors into a dedicated class let us buffer changes into that class only. Use id attributes on elements used for selection. This makes it less likely to break the test by changing the structure of the DOM. Use coarse-grained methods mapped to a business case. For example, instead of having a whole bunch of selectTitle(),fillFirstName(), fillLastName(), submitRegistration(), etc. methods for each registration field, have a single register() method that inputs and submits the data. Again, this isolates possible breaking changes in the page class. A single scenario per feature. Every scenario will have to define its starting point. For our e-commerce checkout scenario, this defeats the purpose of testing itself. A single scenario containing steps of all scenarios. In this case, all scenarios will be merged into a very long one. That makes for a hard-to-read scenario and an even harder to read (and maintain) class. To be able to have multiple scenarios per feature while putting methods into their relevant step definitions, one needs to share the same driver instance among all step definitions. This can be achieved by applying the Singleton pattern to a dedicated class. The last alternative is to use… DI! Actually, Cucumber integrates quite nicely with some common DI frameworks, including Weld and Spring. In thie configuration, the driver bean is a singleton managed by Spring and the single instance can be shared among all page beans. There are also the singletons parts of the Spring bean factory. That’s the reason for the @Autowired annotation in the step definition constructor. But why don’t step definitions get created in the Spring configuration class? Because they are to be created by the Cucumber framework itself using package scanning — yuck. Note that they don’t need to be self-annotated — it’s part of Cucumber’s magic, but they are still part of the Spring context and can be injected. A common mistake made when testing is to think nothing will break, ever. I fell into this trap when I was more junior, and now I try to prepare for failure. In order to achieve that, I wanted to take a screenshot when a test fails so that it will be easier to fix the failure. Cucumber provides a dedicated lifecycle — before and after code run around each test through respective @Before and @After annotations. Note those are not the same as JUnit’s, and Cucumber doesn’t parse JUnit’s own annotations. The easy way would be to create an @After-annotated method in each step definition. Yet, that would just be code duplication. Cucumber also offers hooks: classes which annotated methods are run around each step definition test method. The only constraint for hooks is to place them in the same package as the step definitions so they can be discovered and managed by Cucumber Spring package scanning as for step definitions. private var DATE_FORMAT = "yyyy-MM-dd-HH-mm-ss"
Cucumber unfortunately doesn’t distinguish between a failed test and a skipped one. Thus, screenshots will be taken for the failed test as well as the skipped tests run after it. There’s no global hook in Cucumber. The ensureScreenshotFolderExists() will thus be run before each step definition test method. This way requires us to manage state, so as to initialize only once. The final result is a working end-to-end testing harness that non-technical people are able to understand. Even better, using Cucumber over TestNG let us improve the code with Dependency Injection. The setup of Cucumber over Selenium was not trivial, but quite achievable with a little effort. Despite all the good parts above, the harness fails… sometimes, for reasons unrelated to code, as all end-to-end tests go. That’s the reason I’m extremely reluctant to set them up in the build process. If that would happen every so often, the team would lose confidence in the harness and all would have been for nothing. So far, we’ll use it manually before promoting the application to an environment.